If you’re a bass player ready to expand your sonic horizons, look no further than the B-208SM. It’s an 8-string bass with double course strings tuned in octaves, with the higher-pitched string placed above the standard bass pitch. The result is a full sound that is excellent for any kind of music, especially rock and metal power trios where the bass has to carry a lot of the weight. 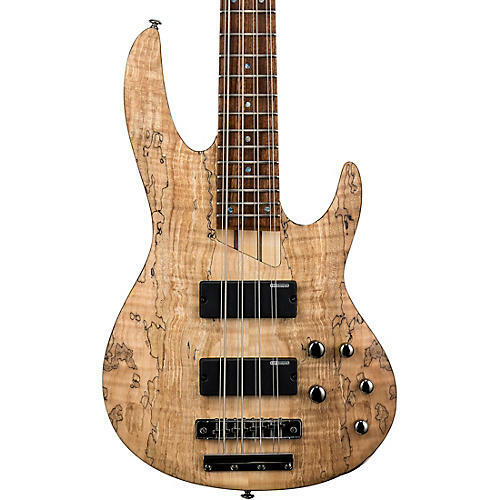 ESP updated the B-208 in 2018 with an amazing spalted maple top, with its unique coloration and grain pattern highlights that make it stand out from the crowd. The B-208SM has a comfortable ash body, a thin U-shaped 5-piece maple/jatoba neck with a roasted jatoba fingerboard, and ESP Designed soapbar pickups with an active 3-band EQ. Available in Natural Satin finish.